Despite his start in the rural flatlands of Ohio, Brody Leven has literally climbed over mountains to pursue his passions. Since 2008, the adventure skier and storyteller has traveled the world, climbing up and skiing down the likes of Denali and Pico de Orizaba, all for the thrill of the challenge. It’s in pursuing and overcoming obstacles where Brody finds his success. A trailblazer in the way of self-produced content, Brody has made a name for himself in the snow sport world, building his brand from scratch. 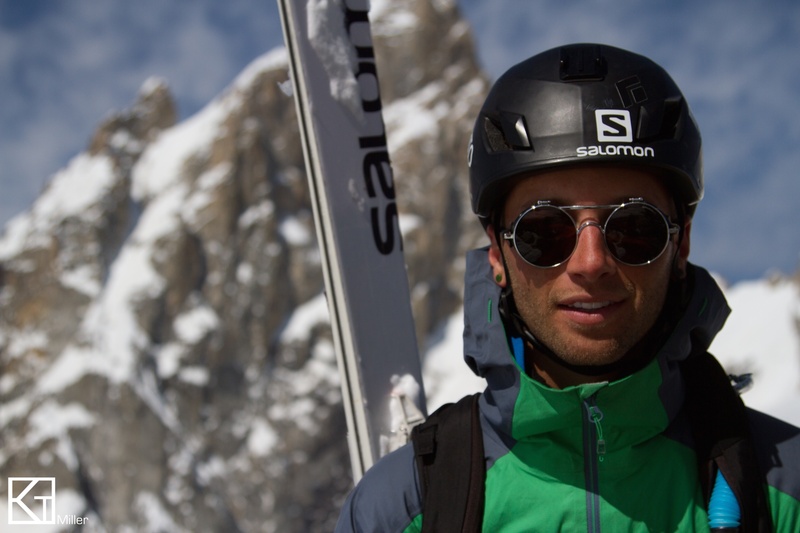 When he’s not shredding powder on high peaks, he’s fighting for change on the environmental front as a representative for climate groups like Protect Our Winters and making his voice heard at the UN Climate Change Conference in Paris last year. For the 28 year old, it’s not about the fame and fortune that other athletes seek. Instead, it’s about following your passions, no matter how difficult the journey. Conscious Connection: It’s great to be with you, Brody. How and when did you get started into skiing? Brody Leven: I’m from the flatlands of northeastern Ohio where I had a little 100 acre-foot hill about five minutes from my house and I would ski there once a week. I don’t come from a family of skiers. I started doing it through school, like in elementary school. I saved up all my pennies in a piggy bank and went to a ski academy, which allowed me to ski for half a day and get tutored for half a day in Vermont during my junior and senior year of high school. I wanted to take that to the next level and move to even bigger mountains, thus I moved to Salt Lake City for college where I went to Westminster College and I was able to ski six or seven days a week as a full-time student. During my time out here, I started seeing the mountains beyond the ski resorts and by the time I was graduating in 2010, I switched gears from skiing in the park at the ski resorts to skiing outside the resorts. This is actually my first official year without any lift ticket or season pass at all. The last couple of years I haven’t even used the season passes that I have, as I do entirely human-powered skiing. I don’t use helicopters, chair lifts or snowcats. I climb everything that I ski. I don’t do any competitions. I travel the world to climb and ski mountains. Conscious Connection: Can you talk more about the transition that you made? What was it that made you seek out that human-powered aspect of the sport? Brody Leven: We started taking our big park skis or our twin tipped skis into the backcountry and we would skin in or snowshoe in to build jumps and do the same tricks we did in the park in the backcountry and land in powder. I quickly started to enjoy that skin in and before I knew it, I was skinning into mountains without even building jumps. I’ve made this transition to really enjoying the uphill. I’m an endurance athlete, so I like the uphill as much, if not more than the downhill. Which is why I can spend hours or days or weeks climbing mountains that then take me seconds or minutes to ski down. And I still enjoy it. Conscious Connection: Can you tell us about your philosophy that has allowed you to live your dream and keeps you maintaining peak performance during these very challenging ascents and descents? Brody Leven: For me, I think being a professional athlete — especially a professional backcountry skier where you’re by yourself a lot of the time — I think inherently it can be a pretty selfish pursuit. You go into the mountains, you ski, you come home and your picture is published in magazines. It sounds all glamorous, but in reality I think that can be a pretty selfish way to do it. Something I’ve chosen to do is take a different path. I don’t follow the traditional model, it’s something I’ve diverged from. I take stewardship up and I take up activism. I’m doing the activities I want to do and I’m training constantly, but at the same time I’m trying to tell stories that educate and inspire and hopefully instigate a little bit of change. Conscious Connection: You’re a lifelong vegetarian. How do you make that work? Does it have an affect on your performance? Brody Leven: I eat healthy, but I don’t eat very consciously. I eat what I think I need and I use it for fuel. I don’t focus on it much beyond that. I have no idea how my body would perform with adding meat. I now see the benefits (of a vegetarian diet). I continue to do it now because there’s obviously a huge environmental reason behind it. I couldn’t say there’s a health reason behind it, because I don’t need it. There’s an ethical reason because I’m certainly not someone that kills any animals. Conscious Connection: You’re all about self-produced content. How have you been successful through that? What are some challenges you face? Brody Leven: I didn’t take the traditional model to being a professional athlete. I didn’t even want to know too much about that model because I wanted to make one that I thought fit. In that way, I don’t have a mentor, I don’t have someone to look up to who’s been doing the exact same thing. Instead, I have people I look up to in the various aspects that I apply. So I’m continuously trying to reinvent this model that I have to make it work best, both as far as engagement with people who follow what I’m doing and also with the way I’m doing it. I’m focused on self-produced content. I like to keep it a little more raw and a little more gritty. I want people to see that I have interests and I do things that are really challenging for me. I think one thing that the world needs is people that are challenging themselves to do things that they want to do, but are difficult for them to do. If people can see that I’m doing that, hopefully it will get them to maybe do something that’s difficult for them. Conscious Connection: You do a lot of work with Protect Our Winters and went to Paris for the 2015 UN Climate Change Conference. What was that like? Why is this cause important to you? Brody Leven: During college, I was student body president at Westminster and found myself focusing more on environmental initiatives. After I graduated, I found myself with this void, again in this position that could be very selfish, and I thought that if I’m building myself this platform for sponsors, for fans and for myself, I can use this platform. I don’t want to be building it just to build myself up, I want to be building it up to build better messages and causes up. I didn’t go to Paris with grandiose dreams of impacting the actual negotiations going on at COP21. I went to Paris knowing that the snow sports industry needed a set of eyes and ears and a voice to what would eventually turn out to be the largest climate negotiation of our generation. As an individual, I see it as something that’s challenging for me. It’s hard for me to deal with this in my job and my passion as someone who’s on snow and in a mountain. I’m constantly seeing this climate change battle, so I’ve challenged myself through that. The evidence is now undeniable, which is really cool. I’m starting to hear so much rhetoric about the fact that it’s obvious something needs to be done, but I’m seeing less action than I am rhetoric. Going to Paris was a really cool place to see projects either catalyzed or continuing and it was also a great opportunity to see what is happening. Conscious Connection: As someone who’s doing something they’re passionate about, who’s successful and who’s having an impact, what’s your one piece of advice you would give to others who also want to make an impact doing what they love? Brody Leven: I’ve incorporated a bunch of things I was interested in to create something that I saw in my mind that wasn’t being done before. I was willing to take that risk to see if it could work. I think that’s something that probably some people are hesitant to do and it’s certainly not something that’s for everyone. I think being willing to use societal norms as guidelines, not as boundaries, and using your interests and passions more as the boundaries. I think that’s something the world needs and it’s also something that can work for everyone in whatever line of work they want to get into. I use it first as a passion and secondly as a career and that’s something I’m certainly happy that I did. Something I use during my speaking gigs is “things that are hard for you, can be good for you.” Hard can mean physically hard, it can mean mentally hard, whatever. I think things that are hard for you can be really good for you.